My boys are both big gamers. They have been since quite a young age. My main concern back then was limiting how long they had access to their games. Given half a chance they would spend a huge chunk of the day gaming. I wanted them to have a healthy balance of time spent outdoors and access to other activities. Little did I know that would be the least of my worries. Suddenly it all changed, and they had devices that allowed them to game online! This meant strangers could now interact with them! I did feel a moment of sheer panic when I first realized what that meant. Before I could leave them to play without being too heavily involved. The games were always age appropriate and only my boys had access to them. We quickly set family rules to try and safeguard them from the dangers associated with online gaming. I was concerned they would see inappropriate messages or have people they didn’t know try and gain their trust. One of my eldest’s closest friends is always adding everyone on his PS4, he had over 100 at one point and hardly any of them he knew. The issue then is that when he adds my son into a chat party, potentially all those strangers than can interact with my son. So even though my son was very selective of who he added to his own friends (only people he knew from school) he was vulnerable to whatever his friend was doing. Although I guess it’s quite commonplace as according to McAfee 27% never monitor what their children are doing online. Left to their own devices they can get caught up in a popularity contest thinking they have the most “friends” but in reality, they are the ones most in danger of online predators. Even when you think your careful you can still be caught out. Once I left my youngest playing on his iPad and he had a message off someone saying, “do you want to go on a date?”. Who knows where that would have led to next and rather worryingly it was a game I didn’t realise even had a chat function! Luckily his brother told me about the message, so I deleted the game straight away. As parents we need to try out the games our children are playing and make sure we are familiar with how they work. A study by McAfee found that 42% of children play games where they directly interact with other players. Children can be very naïve and trusting so it’s important you do everything you can to protect them from the risks involved. The study also highlighted that over a third of parents (41%) do not follow age ratings guides. Quite a few children I know had 18-year-old games when they were only eight. I don’t think it’s healthy to see violence, drugs or sexual content from such a young age. When your child is going to another house for a play date or sleepover that statistic can be quite nerve wrecking. What will they see if the other parents have a more relaxed approach to gaming? 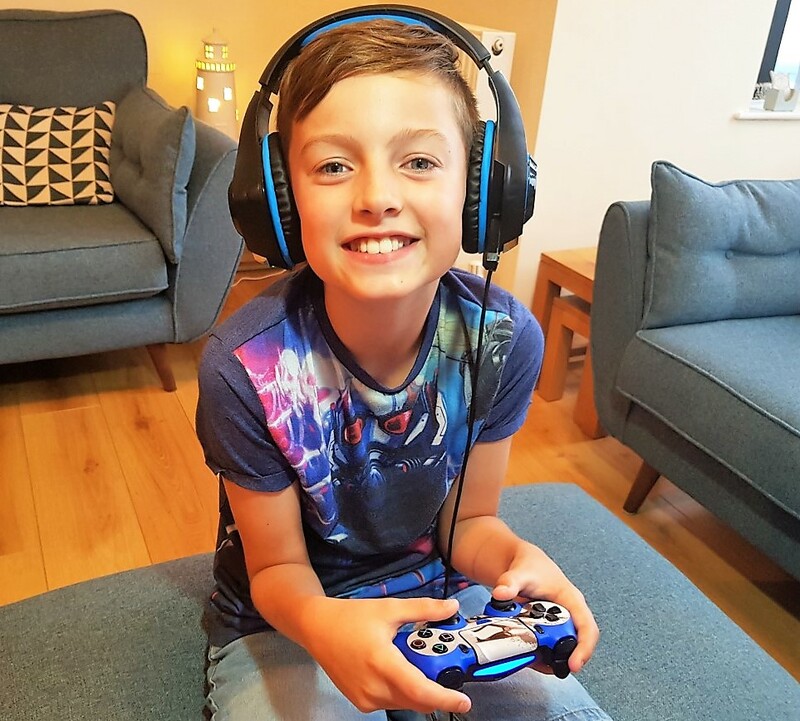 Allen Scott, Consumer EMEA Director at McAfee have some great suggestions to keep your children safe, especially during the summer months when children are likely to be spending even more time gaming. Download a tool like McAfee WebAdvisor can help them avoid dangerous websites and links when children are searching online. Set limits to how long they can play is good advice but hard to achieve. I am thinking about adding automatic time limits, so I can stop having battles with them when its time to come off! Instead the device will switch off automatically when their time is up! Have the safety chat early on, set some ground rules in place. Basically, don’t leave anything to chance!